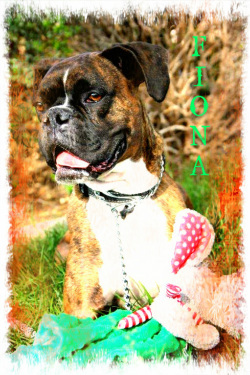 Fiona is an enthusiastic brindle boxer, a big personality in a small package. Fiona manages to make new friends wherever she goes. Her spunky little attitude is irresistible. She has a few good dog buddies at Sachi, but we wouldn't place her in a home with small dogs or cats. Miss Fiona is eager to learn and would love to have you as her teacher!